It could mean anything, couldn't it? Syringes? Thermos flasks? Water pistols? Clouds? The human urinary system? We've actually mentioned this particular crime against copy before (here and here), so we happened to know what they were talking about. But we were dismayed to learn that the phrase fluid transfer solutions is still out there. For readers bemused and befuddled by this wordy, abstract and highly ambiguous descriptor, Pirtek does at least provide a translation. Yes, folks. It's a fancy way of saying "hose". 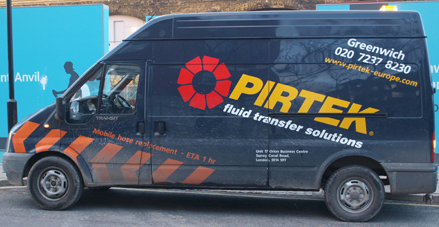 The very fact Pirtek felt the need to translate fluid transfer solutions tells you something. Pirtek knows that no builder in need of an emergency hose ever thought to himself: "now, where can I get a me a fluid transfer solution?" Pirtek's copy is a great example of how self-important corporate jargon could get between you and your customer. And it makes me wonder how much Google traffic Pirtek is losing to its down-to-earth, plain-speaking rival at www.hoses.co.uk. Don't use that tone of voice with me!